The Palomar SlimLipo laser system features a combination of wavelengths at 924 nm and 975 nm that can be used independently or blended to achieve fast and effective laser lipo results. The Palomar SlimLipo laser machine has been cleared by the FDA for laser-assisted lipolysis and it has been widely acclaimed for its reduced downtime and side effects for patients. The unique combination of wavelengths of the Palomar SlimLipo allows it to literally melt away fat, and this system offers flexible treatment tips that make it easy to treat curved areas of the body. 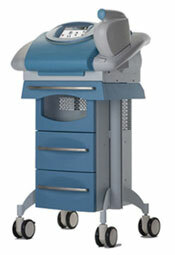 The SlimLipo system also features a 635 nm aiming beam so that the operator can pinpoint the exact treatment area. Whether you are looking to replace your current laser lipo system or are in the market to purchase your first one, SunrayLaser.com can help you save thousands of dollars on the purchase of a pre-owned Palomar SlimLipo laser machine. Just fill out the contact form at the bottom of the page for a fast Palomar SlimLipo price quote with no obligation at all. When you buy a used Palomar SlimLipo laser system from SunrayLaser.com, you can be confident that you will get a quality machine that has been professionally tested and inspected from top to bottom. We are so confident in the pre-owned cosmetic equipment we sell that we provide a 100% satisfaction guarantee.